This Jigsaw Autism Ribbon is ideal for all your projects! We love seeing all the different ways that people find to incorporate this ribbon into their decorating and crafts projects when we go to Autism walks, the variety is so inspiring. People use this versatile ribbon in everything from their hair to their personalized t-shirts to more creative crafts projects. It's also great for decorating team signs and tables at autism events. 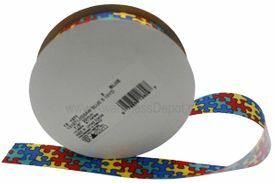 Our autism ribbon is a 100% polyester ribbon that features the multi-colored puzzle piece design printed on both sides of the ribbon. It's a "medium" width ribbon, measuring ?" wide, just under an inch. We sell this ribbon by the 10 yard spool, which is a great length to make sure you have enough to complete your project. The most common way we see folks using this bright autism ribbon is in their hair. Tie around pigtails, weave into a braid or simply cut a big piece and use as a headband. In addition, we love seeing how people incorporate it into their handmade walk t-shirts. It's very versatile, add some wonder-under backing to iron it onto a shirt without the need for sewing or, if your skilled at sewing, you could use it to decorate cuffs or collars by lining them in a bit of color. Since it's polyester it won't shrink when washed. Our autism ribbon is also a great addition to any autism awareness crafts project. Put a bit on a hand-stamped greeting card or cut short lengths and add some fabric paint lettering to make an easy bookmark. Using this ribbon to do smaller crafts projects can make very affordable fundraisers and thank-you gifts for your walk team. You could cut small lengths, fold it into a loop and add a safety pin to make a cheap ribbon to say _thank-you' even to your smallest walk donor. Lengths of autism ribbon also make a bright and easy table decoration at fundraisers. Dress up simple grocery store flower arrangements by tying a bright bow around a simple glass vase, or simply add some curls or bows of ribbon on the table to add some color without blocking any view lines. At one fundraiser picnic, the host had wrapped the utensils up in blue napkins and secured them with a brightly colored bow, it looked great! However you decide to use it, our Jigsaw Autism Ribbon will add color and spark to your projects and events. Check out our full selection of Autism Ribbon Products!